In my 45 years in the mechanical insulation industry, I have never experienced a year like 2009: the troubled economy, the change of administration, continued globalization, NIA and the industry going to Capitol Hill. It was a unique combination of circumstances. The NIA World is not without its challenges, but it is uniquely positioned, with a future filled with opportunities. Each segment of the industry must approach 2010 and beyond with a unified vision, commitment, and involvement to make a difference and compete in an economy we have not experienced before. The opportunities are there; we need to go after them, not wait for them to come to us. The NIA World is abundant with experienced and proven leaders, financial and human resources, technology, and the foundation for making change. We need to harness those resources, work together, and make it happen. You can’t talk about the State of the Industry without including the economy. There seems to be some consensus in Washington that creating jobs is the primary short-term solution and reducing our debt is essential for the long term. There is consensus that no solution will take effect overnight. A slow but solid and sustainable recovery—much slower than we have experienced with similar economic downturns—is likely. How that recovery happens is where the opportunities and challenges present themselves. 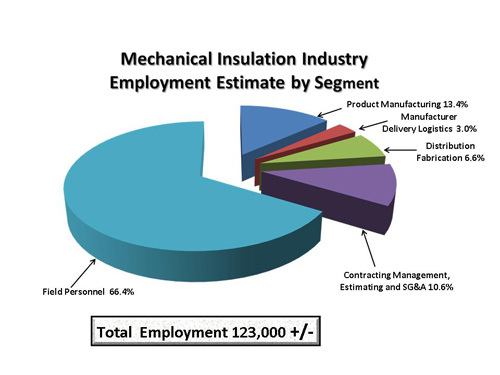 Where does the mechanical insulation industry fit in the recovery cycle? The industry is historically one of the last sectors to feel the impact of a downturn and one of the last to reap the benefits of a recovery. With a slow recovery, the industry may only notice substantial benefits from a longer-term perspective versus year-over-year comparisons. However, some areas and certainly individual companies may enjoy bursts of recovery driven by project securement, mix of business among business segments, specific stimulus activities, and other unique or localized events. The national unemployment rate varies daily; for the sake of this discussion, let us assume the unemployment rate is 10 percent. 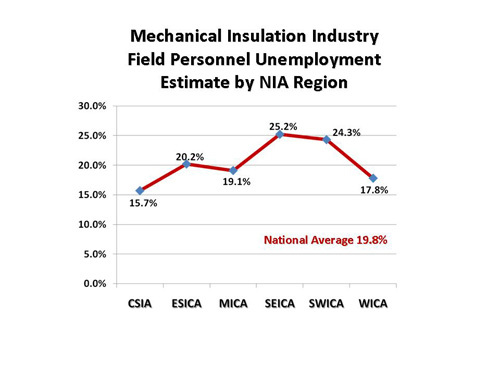 Based on recent analysis, the unemployment in the mechanical insulation industry is estimated to be almost double the national average. The question is: can the industry regain the workforce when needed or will a shortage occur? That answer may depend on the rate of recovery, and significant geographical and company variances are likely. It would be a mistake to assume the industry can easily regain the experienced and trained workforce that unfortunately has fallen prey to the economy. The need to focus on training remains of paramount importance. The difficulty is that in many companies, training is one of the first budget items cut in a slow economy and one of the last initiatives restored during recovery. This dilemma affects all segments of the industry but has the greatest impact on contractors. Management is caught between current workload demands and longer-term expectations and confirmed backlog. If a contractor’s current workload is low but they have a reasonable backlog of work to begin in the near future, they have one attitude. However, if their current workload is low and the backlog is not promising in the short term, training may not be a priority. In simple terms it is the continual struggle between short-term earnings and long-term expectations. That struggle is further magnified with the margin pressure always created in a slow and unpredictable economy. A contractor does not necessarily need trained and experienced workers to secure work, but they are certainly necessary to execute the work properly and profitably. Thus the concern: will the workforce be available when needed? The world in which the industry competes today is much different than 10 years ago or even 1 to 2 years ago. What has changed? These are just a few; many more items could be added. The question for our industry is: does all of this create opportunities or is it just another mind-boggling list of challenges? Opportunity will not come to the industry on its own—we have to make it happen. Our industry needs to accept and embrace whatever hand the economy deals us, but we can positively influence the mechanical insulation industry’s role in that economy. We are in a position we have not experienced in decades. Mechanical insulation needs a voice. The greatest influence point for mechanical insulation is the mechanical engineer, architect, or facility owner. They ultimately decide what type insulation system will be used, the thicknesses, etc. But the mechanical insulation knowledge base of those individuals on a national basis is probably at an all-time low. Compounding the problem, manufacturers—who have historically been the industry educators—have fewer feet on the street today. Many salespeople have limited knowledge or experience with mechanical insulation outside the products or systems they represent, and in many cases they are responsible for multiple market segments. Whose responsibility is it to promote the benefits of mechanical insulation: the manufacturer, the distributor, or the contractor? Most in our industry would point to the manufacturer. In today’s economic and business environment, with the logistical challenges of meeting and spending quality time with specifiers, I am not sure that is true. It is the manufacturer’s responsibility to promote and specify their products or systems, but is it fair today to expect them to take on the overall marketing role, especially since they will be biased to their offerings, as they should be? Even if a manufacturer(s) did step up to fill that role, their efforts would probably not be accepted by their competitors. The access to information via the internet is increasing every day. That is helping bridge the knowledge gap, but is it really educating decision makers? Many individuals depend on information from just a few websites, which could be scary based on a few of the sites I have visited. The industry should assume the generic educator role and provide reliable resources to decision makers and people in the influence chain. Pooling resources would allow a much broader, in-depth, and focused approach that could be extremely effective and economical for all industry participants. Will industry participants promote, endorse, and support that approach with an industry association representing all industry segments generically? To successfully implement and execute such a strategy will require a long-term vision and most importantly a commitment to change. The increased focus on energy efficiency and emission reduction is real. Yes, many talk the talk and do not walk the walk. But the topics have risen in importance from the individual homeowner to the corporate executive to the government legislator. What is relevant today is mechanical insulation’s role in the energy efficiency and environment arena. Are we still considered the “Rodney Dangerfield” who gets no respect in the energy/emission reduction arena in the commercial and industrial markets? The industry has taken giant strides to change that image, but the journey has only begun. Why is it the residential community and several specific products—lighting, windows, weatherization, and appliances—seem to get all the attention when it comes to government incentives for energy efficiency and national awareness? I believe it is a result of long-term presence on Capitol Hill. Tax incentives or rebates seem to attract individuals faster than business, even though in some cases the return on investment, including consideration of the incentive, could be 10-15 years. Individuals feel they are contributing to resolving the energy dependency issue and environmental concerns facing our country while saving a few dollars. Yes, every little bit helps, but the area of greatest impact is in the commercial and industrial markets. If only Capitol Hill and others addressed those markets with the same intensity as the residential markets, the impact over a shorter time horizon would be substantial. In the past, the mechanical insulation industry has done a less than effective job on Capitol Hill influencing legislation. Until NIA stepped up in February 2009, there was no one on the Hill solely focused on mechanical insulation. Other groups’ efforts included the mechanical segment in the commercial and industrial markets, but their primary focus was on other market segments. Mechanical insulation is now getting its independent and generic voice on Capitol Hill, but there is a lot of ground to cover. What NIA has accomplished in its Capitol Hill Initiative in a year is amazing (see “Mechanical Insulation Marketing Initiative 2009 Activities and Accomplishments“). The problem, and opportunity, is that we must go 100 mph while established industries have been going 20 mph for many years. We are definitely in the race and gaining ground, but it is a long race without a defined finish line. Marketing mechanical insulation is not easy. Contractors are focused on being perceived low bidder, so recommending an upgrade of any type in the bidding process can be problematic. If they are not actually or perceived to be one of the low bidders, they may never get invited to the next round. Manufacturers and distributors are focused on their specific product offerings and trying to differentiate their product or system from the crowd, i.e., be the product of choice. In all that, especially in today’s economy, where does anyone focus on marketing mechanical insulation versus other energy efficiency and emission reduction initiatives? Competing with energy efficiency alternatives and competing for maintenance capital dollars are areas the industry as a whole has yet to totally embrace and address. We are still focused on competing among ourselves. The industry needs to tell its story and draw comparisons to other initiatives, talk about the impact mechanical insulation can have with a specific application and holistic approach over time, and provide the tools to all channel participants to market the benefits of mechanical insulation. The industry needs to educate specifiers and owners about the latest guidelines and regulations. Many specifications and value-engineered alternatives do not meet current standards. It appears the American Society of Heating, Refrigerating, and Air-Conditioning Engineers (ASHRAE) may adopt new pipe insulation guidelines that increase insulation values on all but chilled water applications. If those guidelines are adopted later this year, the industry should become the primary marketer. What a great way to increase your business and be a meaningful resource to your customer and to their customer. Currently, the U.S. Green Building Council’s LEED program requires that insulation must at a minimum meet ASHRAE 90.1 recommendations. How many LEED buildings do you know that do not meet that criteria? Do you know what the ASHRAE or other regulatory, code, or governing body minimums are? How do those minimums measure up to federal, state, or local energy efficiency goals? Helping your customer ensure they are in compliance and/or contributing to established goals is a great sales approach. The focus on retrofit, full or partial, of commercial and multifamily buildings has never been greater. That focus is being driven by the need for immediate job creation while delivering long-term energy efficiency and environmental improvements. Where does mechanical insulation fit in that opportunity? Recently, I heard several industry participants indicate building retrofits were of limited benefit to them and the industry. I disagree. With every renovation, large or small, the opportunity is there. We need to educate all channel participants about the potential and return on their investment by examining the potential of upgrading or repairing mechanical insulation in the overall retrofit plan. Maintenance opportunities are available in just about every facility where the insulation system is exposed to the environment and personnel contact. Unfortunately, in a soft economy maintenance is one of the first initiatives cut back or in some cases virtually eliminated. What a mistake for so many reasons, including energy costs, emission reduction, personnel safety, corrosion under insulation, and regulatory or code concerns. From a long-term cost perspective, the facility owners may end up spending many times more money than the cost of an annual maintenance program. The industry needs to tell that story to top management with illustrations and examples. Insulation maintenance is an investment that can pay for itself—it should not be considered sunken cost or a problem that can always be addressed later. Implementing and maintaining an aggressive, meaningful, and sustainable marketing campaign in today’s economy is not easy given bottom line and capital demands. But it is necessary if the industry wants to influence growth. The industry’s time to make a difference and influence the increased use of mechanical insulation is NOW. But we must compete in a new arena against energy efficiency and emission reduction alternatives, process improvements, and other maintenance initiatives. We must embrace that change of focus and be aggressive in our efforts without abandoning our traditional values. 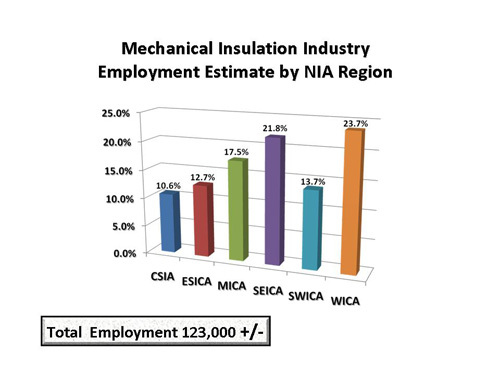 The demographics of the mechanical insulation industry pose both an opportunity and a challenge. The number of manufacturers is relatively small, 100 to 150. There are probably 150 to 200 distributors (but the number of distributor locations is probably more than 1,000). The contractor count is the staggering number: potentially 3,000 to 5,000—maybe more. To the best of my knowledge there are no official published statistics. Regardless, this type of industry profile is not unusual among construction-related fields, nor is the ratio of organized versus unorganized labor contracting or the influence of large versus small businesses. Also common is what I call the “Church Profile”: some step up and sit in the front rows while the majority sit in the back and seldom get involved or never go to church at all. The Church Profile is challenging in a slow economy, especially when the opportunities are abundant. More need to come to church, more need to move up a few rows, and the front row participants need to stay put. Or said another way, more companies and individuals need to get involved, and the leaders, large and small, need to set examples for others. Now is the time for the industry to come together in a unified voice across the country. The industry is pursuing tax incentives for maintenance and for going beyond minimum ASHRAE levels in new construction and retrofit applications, as well as a job creation rebate program in retrofit applications. The industry is going where it has never gone before in pursuit of these incentives. When enacted, the industry must step up and market these incentives, or these efforts will fall by the wayside. I recently sat in on an hour presentation on the advantages of a lighting system and the potential return on investment. Over half the presentation was demonstrating how the tax incentive would reduce cost and increase the return on investment. Using government incentives to lower the net cost and improve the return on investment is a marketing approach we should embrace. Government incentives should be designed to draw the attention of the user of a particular product or service, and the use of those products/services should be of benefit to the economy and our country. Wow, does mechanical insulation fit that definition. The mechanical insulation industry has never had the benefit of federal tax or other incentives. Now is our time: H.R. 4296, the Mechanical Insulation Installation Incentive Act of 2009, can help make that objective become a reality. The NIA World is not without its challenges, and 2010 will certainly provide many, but the future is filled with opportunities. Each segment of the industry must approach 2010 and beyond with a unified vision, involvement, and commitment to make a difference. The foundation for change is in place. We need to harness our resources, work together, and make it happen. This is an exciting and challenging time for our industry. We have overcome rough economic times in the past, and we will again. The NIA World has always been a good place, and the future will only strengthen the industry’s foundation and secure the future for many generations to come. Now is our time.